When in full flower, these trees or shrubs truly remind one of a beautiful, radiant bride stunningly dressed in a specially designed white garment! As most of them flower around November/December, the alternative name, Christmas bush, is also very apt. Species of the genus Pavetta are evergreen trees, shrubs or dwarf shrubs, upright, 0.3-10 m high. The bark on young branches is often a light, whitish colour. The branches are arranged in opposite pairs, each pair at right angles to the ones above and below (decussate). The leaves are opposite, each pair at right angles to the ones above and below, rarely in groups of three at the nodes. They are simple, entire, dark green, glossy or hairy, very thin to semisucculent, usually distinctly petiolate. There is quite a variation in the shape and size of the leaves of the different species and this is one of the important characters for identification purposes. On the lower leaf surface, between the axils of the main and secondary veins, there are often cavities or pockets covered by hairs or leaf tissue, known as domatia. It is speculated that these domatia are inhabited by tiny insects such as mites. Black, roundish dots are scattered over the leaf surface or elongated ones along the veins. These are bacterial nodules. On the stem, between the petioles or leaf bases, there are small, connate leaflets (stipules) forming a sheath around the stem, known as interpetiolar stipules, a characteristic feature of the family Rubiaceae. Many fragrant flowers are borne in terminal, umbellate inflorescences from as early as October to February. The calyx is shortly tubular below, with four, mostly free calyx lobes. The calyx lobes vary in size and shape and are persistent in the fruit. This is another very useful character for identification purposes. Sometimes the calyx lobes are totally absent or only visible as a rim. The corolla is white (in all South African species) to cream-coloured or greenish white, rarely yellow or red in some tropical species, tubular below, with four, free, rounded lobes at right angles to the tube. The lobes have a green apex when young. Four stamens are attached to the throat of the flower tube, alternately with the corolla lobes and long exserted, initially cream-coloured, turning black and twisted when mature. The style is also long exserted. The upper part is thickened, club-shaped and green initially. Small, shiny, green, pea-like fruits (drupes) containing 1 or 2 seeds, develop from the inferior ovary from about February, turning black with maturity. None of the Pavetta species are threatened at this stage although some are restricted and endemic to small areas, for example P. barbertonensis, P. gerstneri, P. tshikondeni, P. zeyheri subsp. microlancea and P. zeyheri subsp. middelburgensis and should be monitored in future. P. barbertonensis is listed under the Lower Risk category and P. microlancea under the Data Deficient category of the Red Data list of Swaziland by Dlamini & Dlamini (2002). The genus Pavetta contains about 400 species occurring in the Old World tropics (tropical and subtropical Africa, Asia and tropical Australia ) but not in Madagascar (Bridson 2003). In southern Africa there are about 24 species, growing in the summer rainfall areas and absent from southern Namibia, the Northern and Western Cape. Most species have small distribution ranges in southern Africa and are endemic to certain areas. They are often found in forests, riverine forests, on forest margins and in bush clumps from sea level to mountain slopes and ravines or more open savannas, whereas some species are almost always associated with rocky situations or with large rocks and boulders. from pavetta, the common name for P. indica in Malabar, India (Van Wyk 1974). Maybe it was originally derived from pavimentum, a Latin word describing a pavement of bricks or stones, thus a mosaic of bricks or stones, possibly referring to the scattered bacterial nodules in the leaves (Van Wyk 1974). The sweetly scented flowers attract many pollinators such as birds, bees, wasps, beetles, ants and moths. These in turn attract birds and other predators. Birds and monkeys love the fruits, which are obviously distributed by them. Much research was done at the University of Pretoria on the bacterial nodules. It was originally thought that the bacteria in the leaves fix atmospheric nitrogen, similar to the bacteria in the roots of some legumes (Grobbelaar et al. 1971; Palmer & Pitman 1972). After several experiments, it could not be positively concluded that the bacteria fix nitrogen (Grobbelaar & Groenewald 1974). In other experiments, the seeds were treated with boiling water in an effort to kill the bacteria. Plants that developed from these seeds, showed abnormal growth ('cripples'). This led to another theory: the bacteria produced a growth regulator necessary for the 'normal' growth of the plants (Grobbelaar 1971). Yet another theory is that the bacteria are responsible for the fact that some species are poisonous to stock (Van Wyk et al. 1990). The bacteria are already present in the seeds. Anatomical studies at the University of Pretoria, showed that bacteria are present in the developing ovaries of the floral buds (Von Teichman & Robbertse 1982; Von Teichman et al. 1982). When the seed germinates, the bacteria can be found in the growth points. Anatomical studies by Herman et al. (1986a) showed that there are special glandular hairs, known as dendroid colleters, present on the inner surface of the stipules enveloping the growth points. These glandular hairs secrete a mucilaginous substance in which the bacteria occur. The very young, developing leaves in the growth point have already fully developed stomata on their upper surfaces, whereas no stomata are present yet on the lower surface where they normally occur. The mucilage containing the bacteria enters the leaves through these stomata on the upper surface of the young developing leaves and from there the bacterial nodules develop in the leaves. and anatomical studies showed a small pore above each bacterial nodule (Herman et al. 1986b). Two of the species occurring in southern Africa, Pavetta harborii and P. schumanniana, have been reported as poisonous to stock-causing gousiekte (Vahrmeijer 1981). According to Fox & Young (1982) the leaves of P. zeyheri, P. edentula and P. lanceolata are edible and are used as a vegetable. The flowers of some species might be used in traditional, African wedding ceremonies (Smith 1966). Various species have cultivation potential, but only about three or four species are cultivated currently and are not readily available in nurseries. The flowers can be used in flower arrangements. With their dainty, snow-white, sweetly scented flowers in umbrella-like clusters or balls appearing over Christmas time, bride's bushes should make delightful garden subjects. Any dull area in your garden could be transformed into a bright spot by planting a Pavetta species. Unfortunately, not many Pavetta species are cultivated at this stage. So far, P. lanceolata is the most well-known species cultivated in gardens, followed by P. gardeniifolia and maybe P. cooperi, P. revoluta and P. schumanniana . They will do well when planted initially in shade or semi-shade, but once established, will grow in full sun. The flowers attract many insects and birds and the fruits are also relished by many birds- bride's bushes will attract all these creatures to the garden. A. Calyx lobes long, linear. All species below have this characteristic. Slender shrub, up to 2 m high, growing in forest or margins of forest usually in dense shade. The leaves are clustered at the tips of the branches and are petiolate, elliptic-acuminate to broadly elliptic-acuminate, very thin, sparsely hairy on both surfaces, but with hairs more dense on main veins on lower surface, margins ciliate. Domatia occur on the lower leaf surface. Bacterial nodules are scattered on the leaf blade or arranged along the veins. The flowers are arranged in few-flowered, little-branched, umbrella-like inflorescences on side branches. The calyx lobes are linear-filiform, 4-6 mm long and persistent in fruit. Flowering has been recorded from October to January. Distribution: Limpopo and Mpumalanga Provinces of South Africa, and Swaziland. Small tree or shrub, up to 5 m high. The leaves are subsessile to distinctly petiolate, obovate-acute to narrowly obovate-acute, thick-textured, almost semisucculent, glossy green, glabrous or very rarely hairy. Domatia occur on the lower leaf surface. Round bacterial nodules are arranged mainly along the main and secondary veins but are sometimes more scattered over the leaf surface. The flowers are arranged in tight, unbranched, umbrella-like balls on short side branches. The calyx lobes are linear, 4-6 mm long and persistent in fruit. Flowering has been recorded from October to February. It grows in coastal bush on sand dunes, on hillsides, in forest and wooded kloofs. Distribution: only in the Eastern Cape.. The leaves are thinner in texture, hairy on both surfaces or sparsely so on the upper surface. It grows on the edges of bush clumps, forest margins or in forest and riverine bush. Distribution: KwaZulu-Natal and the Eastern Cape. Shrub or small tree up to 6 m high. The leaves are petiolate, broadly elliptic-acute, elliptic or broadly obovate-acute, densely hairy, rarely sparsely so, with many secondary veins. Domatia covered by dense hairy pockets occur in some of the axils of the main and secondary veins on the lower leaf surface. The bacterial nodules are round or slightly elongated, mostly arranged along the veins. The flowers are arranged in dense, many-flowered, unbranched balls on side branches. The calyx lobes are linear, hairy, 5-8 mm long and are persistent in fruit. Flowering has been recorded from October to January. It often grows among large boulders or rocks on mountainslopes and hillsides, but also on forest margins or as part of the undergrowth in forest or in bush clumps. Distribution: Limpopo, Mpumalanga, KwaZulu-Natal and Eastern Cape, Swaziland and Lesotho. Dwarf shrub, shrub or sometimes becoming a small tree, up to 3 m high. The leaves are small, sessile to petiolate, elliptic, narrowly elliptic to narrowly obovate, hairy or glabrous. The bacterial nodules are round or slightly elongated, scattered over the leaf surface. Domatia are absent from the lower leaf surface. The flowers are arranged in few- to many-flowered, branched, umbrella-like clusters on side branches. The calyx lobes are linear, hairy or glabrous, 3.5-7.0 mm long and are persistent in fruit. Flowering has been recorded from October to February. Plants grow among other trees and shrubs or in forest in light to dense shade, among rocks or in rock crevices. Distribution: Limpopo, Mpumalanga and KwaZulu-Natal, in Swaziland and also in Mozambique and Tanzania ; it is apparently cultivated in Zimbabwe (Bridson 2003). Small tree or shrub up to 3 m high growing in deep shade in forests or in bush clumps. The leaves are petiolate, fairly large, narrowly elliptic, acute to acuminate and glabrous. Domatia are present on the lower leaf surfaces. The bacterial nodules are elongated and arranged mostly along the main vein, but some round nodules are also present and scattered over the leaf surface. The flowers are arranged in few- to many-flowered, branched, lax, umbrella-like clusters on side branches. The calyx lobes are linear, 4-8 mm long and are persistent in fruit. Flowering has been recorded in December and January. Distribution: KwaZulu-Natal and Eastern Cape. P. bowkeri Harv. Hairy coastal bride's bush; harige kusbruidsbos (Afr.). SA Tree No. 719.1. It is very similar to P. natalensis but the leaves are velvety hairy on the lower surface. Flowering for this species has been recorded from November to February. Distribution: KwaZulu-Natal and Eastern Cape. P. catophylla K.Schum. Sand bride's bush; sandbruidsbos (Afr.). SA Tree No. 719.3. Shrub or dwarf shrub up to 2 m high. The leaves are sessile, obovate-acute, long attenuate at the base, semisucculent and glabrous or hairy. Domatia are absent on the lower leaf surface. Bacterial nodules are round, scattered over the leaf surface and arranged along the veins. The flowers are arranged in tight, unbranched balls, closely surrounded by leaves. The calyx lobes are broad, almost leaf-like, 5-10 x 1.5-3 mm and are persistent in fruit. Flowering has been recorded from October to February. It grows among rocks on koppies (hilltops) and hillsides or in bush clumps and as undergrowth in forest. Distribution: Limpopo, Mpumalanga and KwaZulu-Natal, and also in Mozambique. Shrub or small tree up to 5 m high with thick corky bark, plant giving the impression of being succulent. The leaves are petiolate, large, crowded at the tips of thick branches, narrowly elliptic to elliptic, acute, bright green, glabrous and glossy. There are no domatia present on the lower leaf surfaces. The bacterial nodules are round and scattered over the leaf surface. 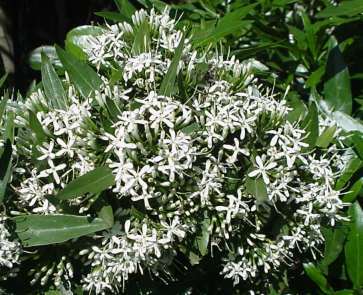 The flowers are arranged in large, many-flowered, much-branched, lax, umbrella-like clusters close to the stem or on short side branches, below the leaves. The calyx is shallowly cup-shaped with four broadly triangular teeth but no distinct lobes, also visible in fruit. Flowering has been recorded from October to February. The plants often grow on rocky hillsides, singly or in bush clumps, rarely on the margin of riverine forest. Distribution: Mpumalanga and KwaZulu-Natal, in Swaziland and also in Mozambique. P. eylesii S.Moore. Large-leaf bride's bush, flake-bark bride's bush; grootblaarbruidsbos, skilferbasbruidsbos (Afr. ); siMunyane (Siswati). SA Tree No. 717.1 . Shrub or small tree up to 8 m with yellowish or light brown, flaky bark. The leaves are petiolate, large, elliptic to broadly elliptic, sometimes broadly obovate, acute or ovate, acute, glabrous or sparsely hairy on the upper surface, the lower surface densely hairy. The bacterial nodules are round or slightly elongated and scattered over the leaf surface. There are no domatia present on the lower leaf surface. Small flowers are arranged in many-flowered, much-branched, lax, umbrella-like clusters surrounded by the leaves or below the leaves. The calyx is cup-shaped with four broadly triangular teeth, also visible in fruit. Flowering has been recorded from November to January. The plants grow among rocks or large boulders on hillsides or flat areas. Distribution: Botswana, Limpopo, North-West, Gauteng and Mpumalanga, and also in Swaziland, Zambia, Zimbabwe and Malawi. Shrub up to 2.5 m occurring as undergrowth in forest or on river banks, usually in dense shade. The leaves are petiolate, large, narrowly elliptic or narrowly obovate and acute to acuminate. They are glossy, dark green above but paler below. Domatia are present on the lower leaf surfaces and the bacterial nodules are round and scattered all over the leaf surface. The flowers are large, arranged in few-flowered, branched, umbrella-like clusters. The calyx lobes are short, broad and rounded, up to 1 mm long and persistent in fruit. Flowering has been recorded from December to February. Distribution: Mpumalanga, KwaZulu-Natal and Eastern Cape, and in Swaziland. Small tree or shrub up to 8 m tall growing in coastal bush or forest not far from the sea. The leaves are petiolate, elliptic to broadly elliptic to obovate, acute to obtuse, shiny, glabrous, dark green above, almost semisucculent. The bacterial nodules are round or slightly elongated and are arranged mainly along the main veins but also scattered over the leaf surface. Domatia are present on the lower leaf surfaces in the axils of the main and secondary veins. The flowers are arranged in few- to many-flowered, much-branched umbrella-like clusters in the upper leaf axils. The calyx lobes are short, broad, almost triangular, up to 2 mm long and persistent in fruit. Flowering has been recorded from November to February, and some occasional, flowering branches in other odd months because of its habitat. Distribution: along the coast of KwaZulu-Natal and Eastern Cape, and also in Mozambique. Shrub or small tree up to 4 m high. The leaves are sessile or subsessile, narrowly obovate, to narrowly elliptic, glabrous and dull green. Domatia are absent on the lower leaf surfaces. The bacterial nodules are round or slightly elongated and scattered over the leaf surfaces. The flowers are arranged in few-flowered, little branched umbrella-like clusters on short side branches. The calyx lobes are short, 0.5-2 mm long and persistent in fruit. Flowering has been recorded from October to February. It grows mainly on rocky outcrops and hillsides but also on flats, often on sandy soil. Distribution: Botswana, Limpopo, North-West, Gauteng, Mpumalanga and Free State. P. zeyheri Sond. subsp. middelburgensis (Bremek.) P.P.J.Herman is a dwarf, compact shrub, almost bonsai-like, up to 0.5 m tall, growing wedged amongst outcrops of rocks and boulders or rocky sheets. Its leaves are sessile, small, narrowly obovate and dull green. Domatia are absent from the lower leaf surface. The bacterial nodules are round and scattered over the leaf surfaces. The dainty flowers are arranged in few-flowered, little-branched umbrella-like clusters. The calyx lobes are 0.5-1.2 mm long and are persistent in fruit. Flowering has been recorded from October to December. Distribution: confined to the Middelburg area in Mpumalanga. P. zeyheri Sond. subsp. microlancea (K.Schum.) 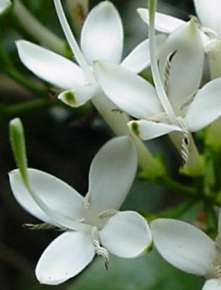 P.P.J.Herman is also a small shrub, up to 0.8 m tall, growing on rocky slopes or loamy flats. The leaves are sessile and narrowly obovate to narrowly elliptic. Domatia are absent from the lower leaf surfaces. The bacterial nodules are round and scattered over the leaf surfaces. The dainty flowers are arranged in few-flowered, unbranched, umbrella-like clusters. The calyx lobes are 1-2 mm long and are persistent in fruit. Flowering has been recorded in November and December. Distribution: in the Sabie, Komatipoort and Crocodile Bridge areas of Mpumalanga, and probably extending into adjacent parts of Mozambique and Swaziland. Bridson, D.M. 2003. 82. Pavetta L. In G.V. Pope, Flora zambesiaca 5,3: 543-598. Coates Palgrave, M. 2002. Keith Coates Palgrave Trees of southern Africa, edn. 3. Struik, Cape Town. Dlamini, T.S. & Dlamini, G.M. 2002. Swaziland. In J.S. Golding, Southern African Plant Red Data Lists. Southern African Botanical Diversity Network Report No. 14: 121-134. SABONET, Pretoria. Fox, F.W & Young, M.E.N. 1982. Food from the veld. Delta Books, Johannesburg. Grobbelaar, N. 1971. Biologiese stikstofbinding. South African Journal of Science 6: 349-355. Grobbelaar, N. & Groenewald, E.G. 1974. Nitrogen fixation by nodulated species of Pavetta and Psychotria. Zeitschrift für Pflanzenphysiologie 73: 103-108. Grobbelaar, N., Strauss, J.M. & Groenewald, E.G. 1971. Non-leguminous seed plants in southern Africa which fix nitrogen symbiotically. Plant and Soil, special vol. : 325-334. Herman, P.P.J. 2005. Rubiaceae. Infraspecific taxa in a southern African Pavetta species. Bothalia 35: 84-87. Herman, P.P.J., Robbertse, P.J. & Grobbelaar, N. 1986a. The morphology of the vegetative shoot apex and stem of some southern African Pavetta species. South African Journal of Botany 52: 212-220. Herman, P.P.J., Robbertse, P.J. & Grobbelaar, N. 1986b. Leaf anatomy of some southern African Pavetta species. South African Journal of Botany 52: 489-500. Herman, P.P.J., Robbertse, P.J. & Grobbelaar, N. 1987. A numerical analysis of the morphology of the leaves of some southern African Pavetta species. South African Journal of Botany 53: 53-60. Kok, P.D.F. & Grobbelaar, N. 1984. Studies on Pavetta (Rubiaceae) II. Enumeration of species and synonymy. South African Journal of Botany 3: 185-187. Kok, P.D.F., Van Wyk, A.E. & Reyneke, W.F. 1987. Studies in Pavetta (Rubiaceae). III. Pavetta lanceolata and its allies (section Aethiopinymphe ). South African Journal of Botany 53: 147-154. Palmer, E. & Pitman, N. 1972. 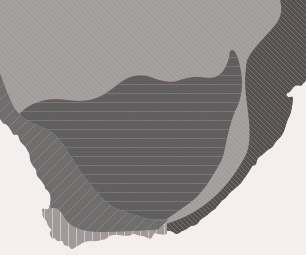 Trees of southern Africa, vol. 3: 2113-2127. Balkema, Cape Town. Vahrmeijer, J. 1981. 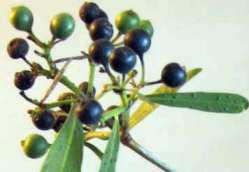 Poisonous plants of southern Africa. Tafelberg, Cape Town. Van Wyk, A.E., Kok, P.D.F., Van Bers, N.L. & Van der Merwe, C.F. 1990. Non-pathological bacterial symbiosis in Pachystigma and Fadogia (Rubiaceae): its evolutionary significance and possible involvement in the aetiology of gousiekte in domestic ruminants. South African Journal of Science 86: 93-96. Van Wyk, P. 1974. Trees of the Kruger National Park, v ol. 2: 584. Purnell, Cape Town. Von Teichman, I. & Robbertse, P.J. 1982. Contributions to the floral morphology and embryology of Pavetta gardeniifolia A.Rich. Part 1. The inflorescence and flower. South African Journal of Botany 1,1/2? : 18-21. Von Teichman, I., Robbertse, P.J. & Van der Merwe, C.F. 1982. Contributions to the floral morphology and embryology of Pavetta gardeniifolia A.Rich. Part 2. The ovule and megasporogenesis. South African Journal of Botany 1: 22-27.